As a 42-year-old grown man, I don’t have any interest in Barbie stuff. But even I have to admit this is one cool house! She has a grill and a pool on the roof (the plumbing for that has to be a nightmare), and the stairs can turn into a slide with a ball pit at the bottom. Heck, even the kitchen has a 3-D food printer replicator. Man, we’re getting into some Star Trek type stuff here. How far in the future does Barbie live? Other rooms include a music stage, dance floor, home theater, and Barbie’s bedroom, which has a fashion stage, dress up closet, and a computer that would make any eSports fan jealous. On the bottom of the screen is an icon that if you click on it, you can view Barbie, her friends, Ken, and even a bunch of puppies and a kitten. You can place them anywhere you want in the house. Sometimes they will have a bubble over their head expressing what they want to do (like go swimming, dance, etc.). If you place them in the correct parts of the house, you’ll get a heart. Fill up a heart icon with these hearts and you’ll get a gift! These include furniture, wallpapers, paint, and other items that you can decorate the house with, using another icon on the opposite side of the screen. Nothing really wrong with the game. You get a bunch of food and furniture and things you can drag around and put where you want. Make a hamburger or just a mess. Sometimes Barbie’s friends look a little creepy looking all lifeless sitting in the ball pit, but they are dolls after all. It looks like they can add a bunch of stuff later. They’re already teasing a bathroom and a new kid character for later. So if you have a little girl who loves dollhouses, this may be a good one to try. Nothing violent or objectionable here. Reading skill isn’t needed as Barbie explains everything, but parental supervision is still recommended for the in-game ads and purchases. Barbie gives you a tour of her house when you get started, so everything is pretty self-explanatory, but sometimes a bubble with icons would appear over someone’s head that I had no idea what it was. Like books. Where does Barbie keep her books in this house? And I don’t know if it’s because I had a review code that unlocks everything, but there is SO much stuff to do that it was almost overwhelming at first. But that may not be a bad thing overall. 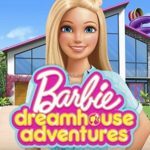 While I don’t think this app will replace the fun of physical play with a real dollhouse, it might be a nice compromise if the real one is too expensive, as the app is free to play. Plus you don’t have to put it together or clean it up!